Just what does ‘broad spectrum sunscreen’ mean? The short answer is that broad spectrum sunscreen offers protection from both types of damaging UV (ultraviolet) sunlight, which includes UVA and UVB. Both of these dangerous UV radiation types damage the skin, but they do so in different ways. UVB radiation causes direct damage to the outermost skin in the form of sunburn (ouch!). UVA radiation penetrates deeper into the skin, triggering the physical symptoms of premature aging (think wrinkles and discolored patches of pigments) as well as having the potential to cause skin cancer by altering skin DNA. Continue reading for the longer answer which includes a breakdown of why you should ONLY use broad spectrum sunscreens. A better question would be, ‘Why suffer from melanoma when you can prevent it in just two minutes?’. But doesn’t every sunscreen protect you from melanoma? Unfortunately not! The simple truth is that most commercially available sunscreens on the market (like the stuff you grab off the shelf at your local supermarket) only block UVB radiation. This leaves unaware consumers exposed to immune-system-degenerating UVA radiation, which plays a large part in the development of skin cancer. These inferior sunscreens fail to protect you against the extremes of the UV spectrum. This means unblocked short-wave UVB rays can burn the surface of your skin while long-wave UVA rays penetrate deep into the skin. The latter negatively affect your microscopic (yet precious) genetic materials via the production of carcinogens. This could leave you with big medical bills for expensive treatment, or possibly even an incurable skin cancer. This makes broad spectrum protection in sunscreens a must. If that wasn’t enough, UVA radiation also has the added effect of advancing the visible signs of ageing. So while the hydration provided by a sunscreen may alleviate the development of wrinkles and skin sagging, these benefits will be more than cancelled out by the ongoing absorption of UVA rays. For these reasons all of the sunscreens recommended here on SimplySunSafe are broad spectrum sunscreen. If you’re looking to upgrade your sun protection and make sure you get the best, check out one of our handy buyer’s guides. What is in broad spectrum sunscreen? The FDA approves just 17 ingredients for use in sunscreen’s medicinal cocktail. However, not all of these 17 ingredients provide broad spectrum protection meaning they must be used in combination with others to allow the sunscreen to identify as ‘broad spectrum’. Some of the ingredients that stop UVA radiation (indicating they protect against the usually ignored end of the UV spectrum) include avobenzone, oxybenzone, titanium dioxide, and zinc oxide. A sunscreen must also have an SPF of 15 or higher to qualify as broad spectrum. Sunscreen active ingredients are broadly classified as chemical and physical. Chemical active ingredients form a protective film against UV radiation. This partially protects the wearer’s skin from sunburn by absorbing UV radiation, but may generate free radicals and cause damage in other ways. Physical sunscreens tend to trump their chemical counterparts because of their unique active ingredients, zinc oxide and titanium dioxide. These two ingredients work by putting up the biggest fight against the sun for wearers. Rather than absorbing the sun’s rays (which eventually seep past the chemical film and enter your skin) zinc oxide and titanium dioxide physically block/deflect the sun’s most harmful rays altogether! For those with heat-sensitive skin, like those with rosacea, a physical sunscreen will favorably repel the heat and keep you slightly cooler during that blistering mid-August picnic in the park. Titanium dioxide may occasionally cause skin discomfort or rash and does not fully block UVA. These qualities make it similar to the chemical filters mentioned (avobenzone and the particularly nasty oxybenzone). This places zinc oxide at the top of the sunscreen ingredient hierarchy (because it’s the most effective). Look out for it on the back of the bottle the next time you shop for sunscreen! And it’s preventing them too! Critical to understanding broad spectrum sunscreen’s definition is to understand the simple physical principles of photons (light particles). Different wavelengths produce different effects. Between 280 and 400 nanometer wavelengths (found through the seasons as long as the sun is shining) will cause harm to human skin. Broad spectrum sunscreens are becoming more widely available all the time (because they offer the best protection!). But how can you tell you’re getting the real deal? Sunscreens usually have their active ingredients in a prominent location on their label, separated from the other ingredients. 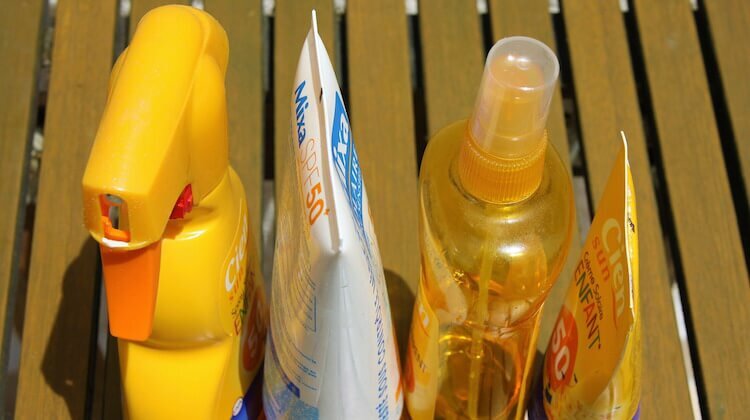 The packaging will also usually tell you whether a sunscreen in physical or chemical. If for some reason you don’t know what the active ingredients are (e.g. the label is faded) take note of the sunscreen’s texture. Physical sunscreens will be thick and opaque, taking a bit more time to rub into the skin – in fact it’ll likely leave a tinge of white on your skin if it you haven’t rubbed it with a bit of elbow grease. Chemical sunscreens tend be runnier and will absorb easily without leaving a white cast. (Chemical sunscreens are also more likely to irritate the skin and aren’t effective until 20 minutes after application.) As physical sunscreen are always broad spectrum, a thick sunscreen will do the job. Steer clear of runny sunscreens when you don’t know the active ingredients. Hopefully this has cleared up what broad spectrum sunscreen is and why it’s so important for sun safety. The next time you plan for a beach day with some friends, you’ll be able to keep them safe by bringing along a broad spectrum sunscreen! And when they inevitably ask you exactly ‘what is broad spectrum sunscreen?’, tip them off with your newfound, indispensable skin care knowledge.